N Chandrababu Naidu, leader of the BJP's latest alliance partner, Telugu Desam Party (TDP), and actor-turned-politician Pawan Kalyan at a rally held in Hyderabad this evening. Gone was the rancour that had marked relations between the BJP and the TDP over the seat-sharing exercise in Seemandhra, and the two leaders sang paeans about the alliance's prospects in Andhra Pradesh. 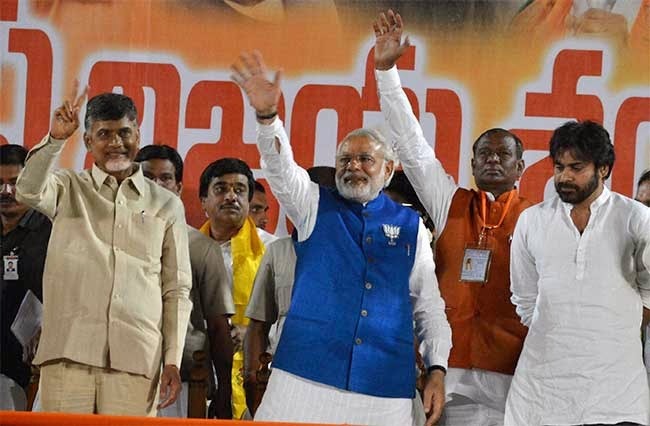 Mr Modi, the BJP's prime ministerial candidate, in a symbolic move, appeared on the stage flanked on the one side by Mr Naidu and, on the other, by Mr Kalyan, whose Jana Sena had offered unilateral support to the NDA in the Lok Sabha polls. "Pawan, Modi and Naidu is not one plus one plus one is equal to three, but 111,'' said Mr Modi. "We are both in a win-win combination,'' added the TDP chief. Mr Kalyan singled out the BJP leader for fulsome praise, and said his new party was, in fact, a "Modi Sena". In the public meetings addressed by Mr Modi at Nizamabad and Karimnagar earlier in the day, it was Mr Kalyan, the 42-year-old film star, who had earned Mr Modi's praise. The TDP leader failed to find any mention, setting off speculation about the strain in ties between his party and the BJP. Of Mr Modi's four rallies in the Telangana region of Andhra Pradesh today, Mr Naidu attended only the ones held at Mahabubnagar and Hyderabad. Sources said the BJP's local leaders in Nizamabad, Karimnagar and Mahbubnagar opposed Mr Naidu sharing stage with Mr Modi at the rallies there. BJP leaders in Mahabubnagar finally relented after negotiations with the TDP brass. The BJP and the TDP clinched their partnership after days of discussions last month, overriding protests from local leaders of both parties. Last week, the freshly-minted alliance threatened to come apart over allocations of seats. The two parties are yet iron out differences over three seats in Seemandhra which had been allocated to the BJP, but are being contested by the TDP too. Tomorrow is the last date for withdrawal of nominations.